Life of a Catholic Librarian: June novena nerds, report in! My latest piece over at Catholic Mom is up, and it got me to thinking! Novenas. I like to pray one per month, and I was slacking on June. ;-) It's always a humbling experience when you see Lisa Hendey tweet something out about a new article over at Catholic Mom, you admire the embedded featured photo, then think to yourself: "That sounds like something I would like to read." And only then do you remember that YOU wrote the article. So that's what happened again this month, and along with my hyper organized, early submission of aforementioned article, I also forgot to set things up to pray the Sacred Heart novena along with my group of friends like we had been planning. We're back on track now. And the novena starts TODAY! Pray More Novenas is hosting this novena, so you can sign up to receive the daily emails with all of the prayers included, happily. I also tweet a link out to the prayers each day, so if you follow me on Twitter you can follow along that way as well. I put the Twitter widget back on the right sidebar of the non-mobile site for the blog, so you can link to it right on there if you'd like. I remember someone asking me about that widget a while back after I removed it (Cindy?) and I've been toying with putting it back, so now here it is, back. :0 I know not everyone uses Twitter, so this way you can still see what I'm up to on there even if you don't have a Twitter account. The feast of the Sacred Heart is next Friday, June 23rd. 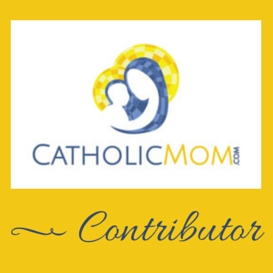 I talk all about it over at Catholic Mom, if you'd like to go take a peek. We love comments over there!